Neil Diamond sound alike & look alike Tom is available with professional tracks or a top quality band. He is always available to meet & greet every audience & is the kindest, most genuine performer I have ever had the pleasure to work with. This tribute artist exceeds the expectations of many who are looking for the best in celebrity impersonation. Tom’s authentic costumes, moves and magic bring “The Jazz Singer” to life time and time again. Tom (pronounced “sage”) has been a full-time entertainer for his entire adult life singing NEIL DIAMOND, ELVIS, SINATRA, TOM JONES and many others.Tom’s lookalike & sounalike tribute to “The Jazz Singer” has been featured at top casinos in Atlantic City, Las Vegas, Phoenix-Scottsdale & Ontario as well as productions like Canada’s “Legends Alive”. Tom is a favorite of the longtime Neil Diamond fans, the Diamondheads, and is often recognized as the best among the Neil Diamond lookalikes and soundalikes. Tom recently performed for the 7th straight year at the annual Neil Diamond Chicago Birthday Party in Chicago, IL. 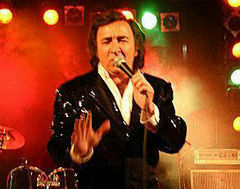 Tom has also been chosen for three Carnival Cruise Lines Neil Diamond Fan Cruise (Carnival Pride and Carnival Legend). He’s appeared in a nationally distributed documentary about Neil Diamond impersonators entitled Feel Neil, directed by David Sarich & filmed on location in Atlanta, Las Vegas, Pigeon Forge, San Francisco, and other places.